This is the Pro-Line Hauler Bag. 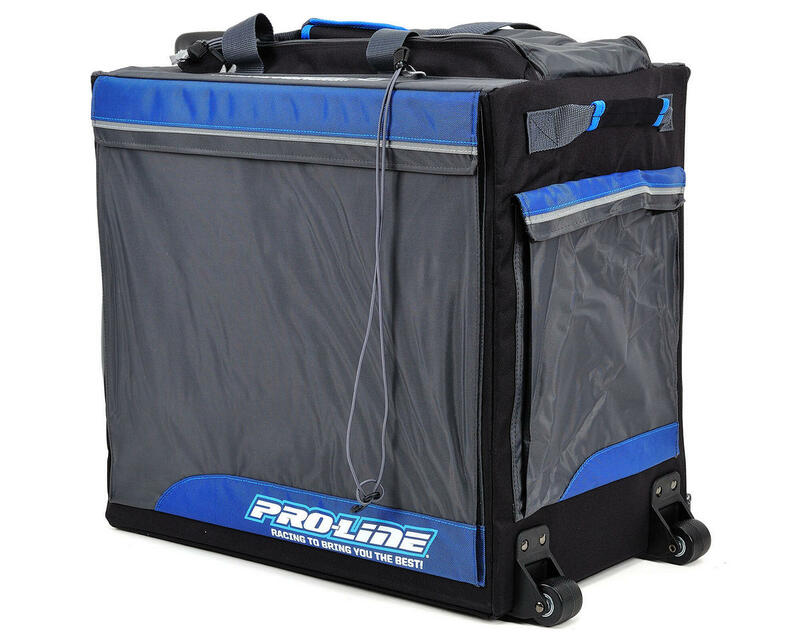 Designed with 4 easy access drawer compartments, several zipper pockets and tool storage, the Pro-Line Hauler Bag is perfect for your RC needs. 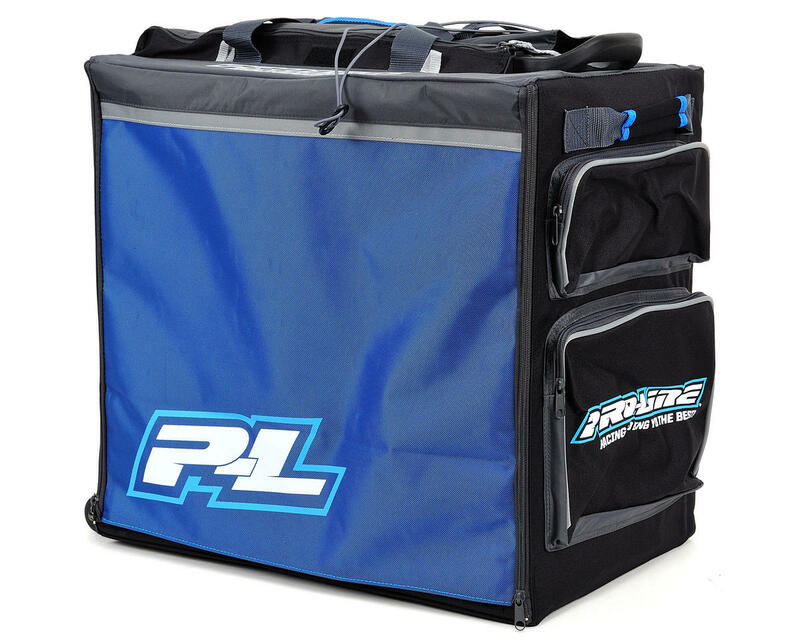 Stylish Pro-Line logos on the front, top and side stand out when arriving at the track and a collapsible pull handle and smooth rolling casters combine to get you organized in the pits. The Hauler Bag also includes tie-down Bungee straps for securing 1 vehicle (Buggy, SC, Truck, etc.) on top of the Bag for fewer trips between the Track and your vehicle. Pretty decent hauler bag for taking all your tools and accessories to the track. The top has a pair of bungee straps to secure your SCT or Buggy. I haven't tried it yet but it should hold a truggy also, might have to take the wheels off though. The four drawers have plenty of space for all your spare parts & tires, chargers, batteries, shock oil, etc... Pretty much anything within reason that you'd need while practicing or racing should be able to fit into the drawers. The pockets on the outside also have plenty of room for cables, extension cords, anything else that won't fit inside the drawers really. Assembly was easy. The drawers take probably 5 minutes each to build and the shelves velcro right into place in a few minutes. The one thing I dont like is that the bottom drawer doesn't always slide in and out as easily as it should. The back corner of it has a bit of a lip that catches on the drawer above it. I have a few ideas of how to fix it, but it is a bit of an annoyance. Simple enough to put together.. Was able to load up all my gear that took several trips into 1. Only issue I have is the bottom drawer is tight to get in and out. In order to get it in you have to lift up on the shelf holding the 2 small drawers. only thing in those 2 middle drawers are 2 car stands. calipers, ride height and camber gage in 1 drawer and a gallon sized bag of sc5m parts (A-arms, shock towers and so om) really not that much weight. BRANDON B. SUMMED IT UP TO THE T.. DITTO TO WHAT HE SAID, WORD FOR WORD.